Oncology information system can be defined as a complete information and image management solution for cancer patients which allows medical practitioners to oversee all the aspects of oncology care their patients. Oncology information systems combines radiation, medical and surgical oncology information into a complete, oncology-specific EMR that which allows practitioners to manage the patient's entire journey from diagnosis through follow-up. Globally technological advancement in healthcare segment and increasing cases of cancer patients globally is expected to remain key growth drivers for oncology information systems during the period of study. 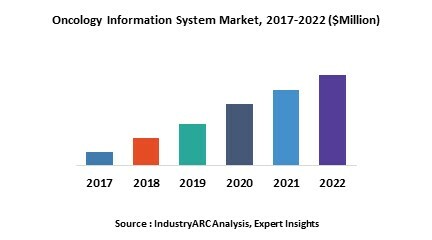 This report identifies the oncology information system market size in for the year 2015-2017, and forecast of the same for year 2022. It also highlights the potential growth opportunities in the coming years, while also reviewing the market drivers, restraints, growth indicators, challenges, market dynamics, competitive landscape and other key aspects with respect to global oncology information system market. Geographically North America dominated the oncology information system market owing to technological advancement, higher penetration rate of such systems in healthcare practices and well established infrastructure. North America was followed by Europe and Asia-Pacific as the second and third largest markets for oncology information system. However Asia-Pacific is expected to remain the fastest growing market during the period of study driven by rapidly expanding healthcare industry, technological advancement and developing infrastructure in the major economies such as India and China in the region. 15.3. Bogardus Medical Systems, Inc.